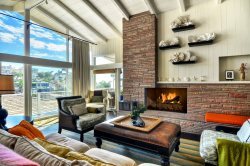 SEASIDE ESCAPE is Your Premier Vacation Rental Condominium destination in Dana Point! Seaside Escape is the perfect vacation rental for your family vacation, short-term housing needs, or corporate housing rental. With Forever OCEAN VIEWS and steps from The Strands Beach and The Ritz Carlton you can feel the ocean breezes the moment you arrive! SEASIDE ESCAPE is perfectly located for a relaxing rendezvous for two, a fun week at the beach with the family, or a month or more long retreat for snowbirds wishing to escape and rejuvenate either from the blistering heat of the desert or the snowy cold. Come and enjoy our beautiful, temperate climate! There are so many ways to relax while you’re here…. Enjoy cooling off from the hot sun after a day at the beach at our community pool and spa. Enjoy a morning walk amongst the palm and abundant flora to the local coffee shop across from the Ritz Carlton and St. Regis. Take a short stroll into downtown Dana Point and The O.C. Dana Point Harbor where there are numerous local shops and restaurants awaiting discovery. Educate yourself and your family about the local sea life and the oceans at the Orange County Marine Institute. The most popular way to relax at Seaside Escape is to make yourself your favorite drink, sit back next to fireplace, enjoy the ocean view, and pick out one of the MANY books for your quiet enjoyment! We’re readers and Our bookshelves are FULL of fiction, non-fiction, summer reads, best sellers, and romance novels and books. Take a book or leave a book – We like to share our favorite reads with our wonderful guests. Tennis Anyone? Bring your racquet! Walk to the Tennis Villas. The Tennis Villas is a professional tournament style tennis club and resort offering weekly and monthly passes to our out of town guests (for an additional fee). The Tennis Villas also offers a pool, spay, gym, and lounge. For additional information please see The Tennis Villas website. Bring Your Golf Clubs! The Links at Monarch Beach Resorts at The St. Regis Resorts is open to the public and very affordable! Take in the ocean breezes and sweeping vistas while enjoying a relaxing game of golf… it doesn’t get much better than that! For additional information please see The St RegisGolf website. Seaside Escape is just around the corner from The Orange County Dana Point Harbor and downtown Dana Point and is just a short 15 min drive into the beautiful and ‘artsy’ seaside town of Laguna Beach. The historic San Juan Capistrano and the quaint Los Rios District, which includes charming antique shops, restaurants, and art galleries, are within a quick 10 minute drive. There’s even a petting zoo for the smaller members in your family! Seaside Escape is centered and perfectly situated to all of Southern California’s entertainment amenities and so easy to find. We’re located just 60 minutes south from Los Angeles Airport, 60 minutes north of San Diego Airport, and 30 minutes south of John Wayne Airport in Orange County. Seaworld, Disneyland, Knott’s Berry Farm, Legoland, and The San Diego Zoo are all within an hour drive or less from Seaside Escape not to mention the hundreds of galleries and museums and thousands of quality restaurants throughout South Orange County for you to enjoy during your stay. Southern California is centered at the heart of the Entertainment and Vacationing Mecca! Local activities include the beach, hiking, biking, golf, tennis, racquetball, basketball, fishing, horseback riding, shopping, live theatre, cinemas, museums, sightseeing, swimming, snorkeling / diving, boating, sailing, water skiing, surfing, windsurfing, parasailing, jet skiing, boating, rafting, and much more. Out side the local area there are many entertainment opportunities. Within an hour (either north or south of Dana Point) you may choose to explore Disneyland, Newport Beach, Balboa Island, Catalina Island (Ferry leaves from Dana Point Harbor) San Clemente Pier, Knott's Berry Farm, Legoland (perfect for those under 12), Universal Studios, San Diego’s Wild Animal Park, The San Diego Zoo, or the many theaters in Hollywood and surrounding theaters in Los Angeles… or… drive a little further south past San Diego and enjoy an exotic adventure for the day in Tijuana, Mexico. Don’t forget your passport! Sleeps 6 comfortably: Queen in Master Bedroom / (2) Twins in Second Bedroom, Queen sleeper sofa. Private full size washer / dryer inside. Upstairs unit for greater privacy and AMAZING OCEAN VIEWS! One covered parking space near unit. And… A PACKED Closet Full of Boogie Boards, Sand Toys, Chairs, and Umbrellas for your use at the beach!